Next week on All Star Family Feud, The Project team will take on cast members from Neighbours. The Project team will be playing for Carrie’s Beanies For Brain Cancer with team captain Carrie Bickmore leading her colleagues Waleed Aly, Peter Helliar and Steve Price. The Neighbours team have assembled an all-star cast led by team captain Olympia Valance, alongside Alan Fletcher, Jackie Woodburne and Stefan Dennis playing for Australian Childhood Foundation. Can the soap stars outshine The Project team? 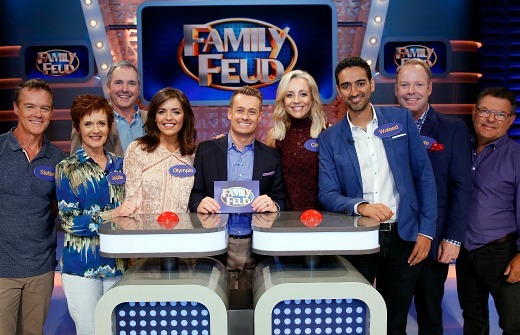 I heard that Price was 5′ 1″ and Grant Denyer is about 5’3″ I think. I am sure Grant will make a joke or two about this. I will be watching but not because of Price. He makes me rush for the remote whenever he is on. Looks great. What a battle Monday night will be. All Star FF v Married at First Sight vs MKR! Nice choice for the timeslot battle – I had no idea that was Olympia from the ads until I read this article she looks quite different! She certainly doe. I thought the same. Omg, I knew Steve Price was short, but didn’t realise he was that short ! !